Today getting married in Italy represents for many people not only a fashion, but also a dream that comes true. More and more foreign couples decide to get married in Italy, especially British couples, or people from different countries, including Irish, Scottish, American and Australian couples. Among the favorite destinations there are Venice, such a romantic city, Verona, for its myth of love between Romeo and Juliet, and also Florence, Rome, Sorrento, with its beautiful churches on the coast, the Como Lake, famous since George Clooney has bought a wonderful villa there, and many other locations in Italy which have been chosen by many famous people who love the Italian taste and elegance, such as Tom Cruise and Katie Holmes, Woody Allen and Soon-Yi, Sophia Coppola and Thomas Mars. That day everything has to be made in an Italian way: the locations, the menu, the decorations, the wedding dress and the photography service. Italy, the romantic place par excellence, has a strong appeal for people who want to crown their dream of love far from their country and today it is a possible luxury and it’s worth paying an extra cost for its breathtaking landscapes, for its natural and artistic beauties, for the gastronomical excellence of Italian cuisine and its wines of high quality, for its mild climate and for the warm hospitality which is always reserved to tourists. Every marriage is a unique and unforgettable fairy tale, for this reason many people often chose a castle that day, such as the Castello Belvedere in Desenzano del Garda, which is an ideal place to spend it as if it was a true fairy tale. So, on their wedding day, we have the pleasure to welcome all brides and grooms who have chosen or who are going to choose our beautiful country as the setting for their marriage, not only in the name of exteriority but especially in the name of love because in Italy “love is in the air “.. 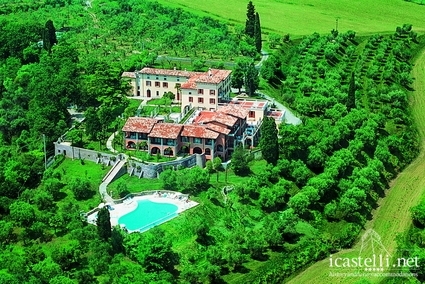 This entry was posted in Hotels, Design and SPA Hotels, Boutique and Charme Hotels, Historic and Luxury Castles, Italy and tagged castello belvedere, cucina italiana, hotel desenzano del garda, hotel firenze, hotel lago di como, hotel roma, hotel sorrento, hotel venezia, hotel verona, italian food, locations matrimonio, marriage in a castle, marriage in italy, matrimonio in castello, matrimonio in Italia, wedding locations. Bookmark the permalink.